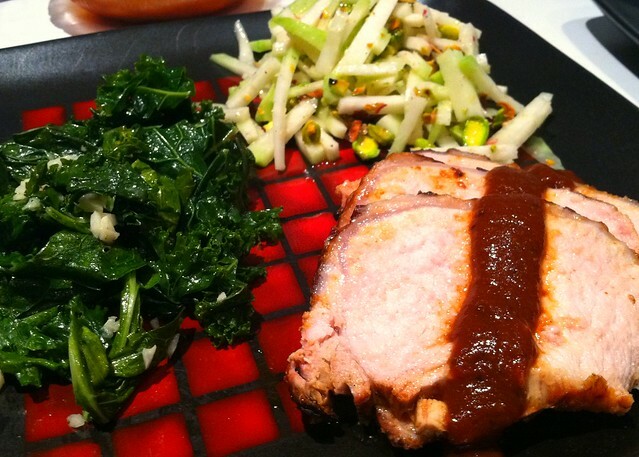 bbq pork with kohlrabi slaw and sauteed kale + collards. – ugly food tastes better. 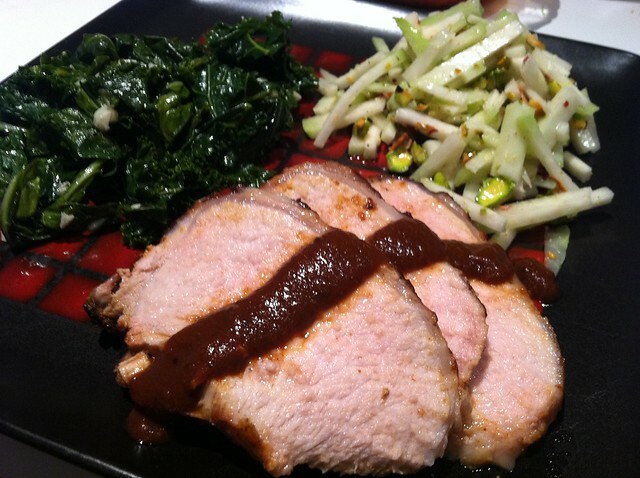 bbq pork with kohlrabi slaw and sauteed kale + collards. Serves 4. Or me and the Bee to eat twice. Nutrition – YAY! You done good, girl. 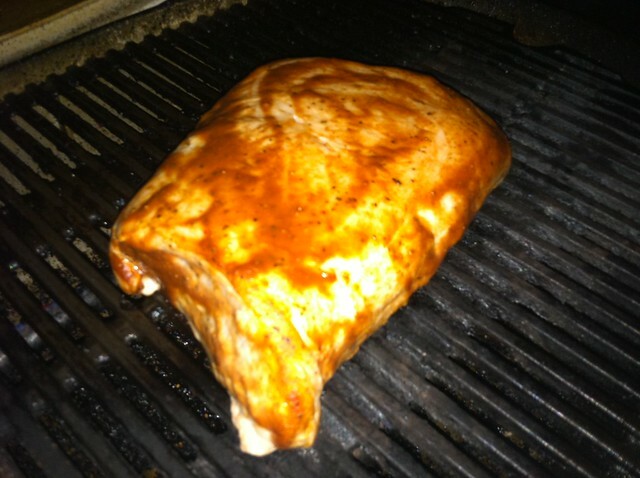 BBQ sauce or rub of your choice, I used Stubbs BBQ sauce that I had leftover and needed to use. I was so excited for the kohlrabi. I had never had it before, and I didn’t know what it was going to taste like. Now i know its a cabbage apple! Or a Cabapple. Whatever cheesy term you prefer. I ALSO know that you might lose a hand, chain mail glove or not, if you try and julienne the thing on your mandoline. Please get a sharp knife and cut carefully, or if you know a better way, please god share it here. Kale on the other hand, I despise. But it came in the CSA and i like to keep trying things. Plus I hadn’t had it in awhile. In case you were wondering (ahem:Danielle) I still loathe it, but I choked a couple bites down for my health. I originally had planned on making this recipe for Sauteed Kale with Kohlrabi but after making the separate components I didnt see how they could possibly go together. I made a wise decision. 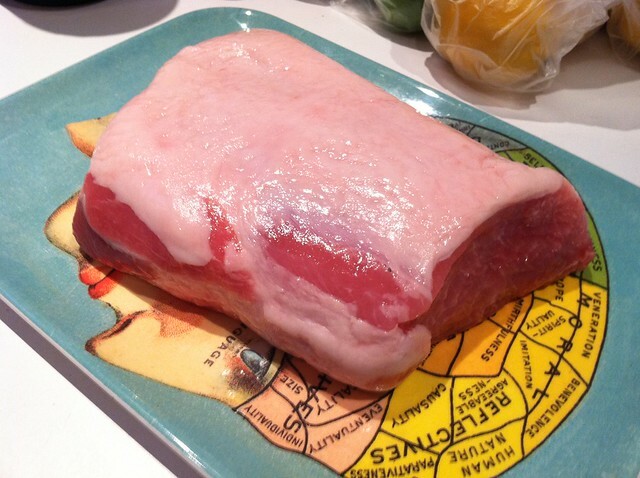 To start – Put your rubbed pork on the grill at a medium high heat for an hour and a half, basting as necessary, and remember, always fat side up! While it is cooking, prep your veggies. Then when it is at 150 degrees, take the pork off and tent it in foil on a platter to rest and finish cooking, this takes about 10 minutes. During this time, heat your oil in a sauce pan with some water if need and sautee your garlic ,when it has browned, add your leafy greens and let wilt. Mix lime juice, zest, pil, salt and pepper in a bowl. Add kohlrabi and pistachios and stir until covered. 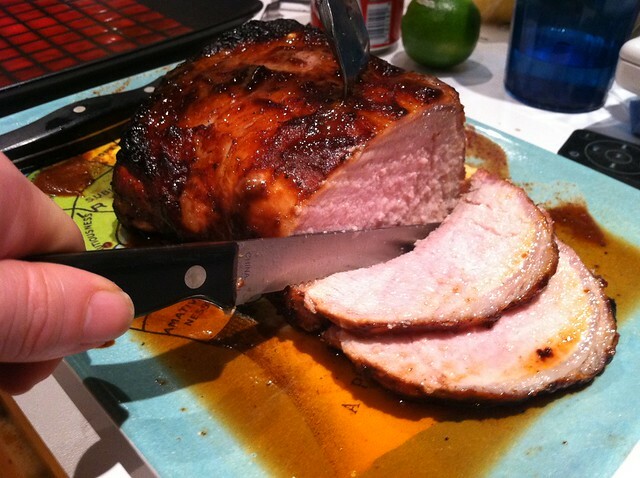 Slice your pork and serve! Consensus – Pork was juicy and awesome, kale was vomit worthy unless you like that kind of thing, kohlrabi slaw was AMAZING and perfect with the pistachios. I’ve never had Kohlrabi either, but it looks really good. I’m a pretty big kale fan though, I love green leafy things – spinach, kale, arugula. Ha! The boyfriend hates kale. He’s gotten to the point where he basically refuses to eat it. I’m fairly indifferent on it but I LOVE kohlrabi. I love me some spinach, but kale is a big no ma’am for me so far. i’ll keep trying. 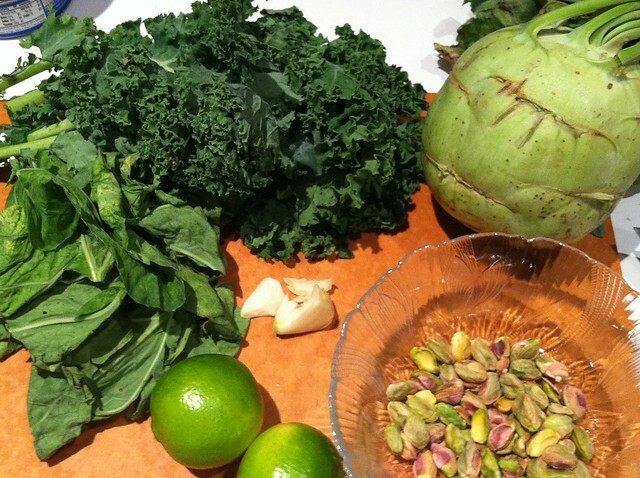 And you should try kohlrabi! it is so so good! Swede- what’s your favorite kohlrabi prep so far? Kohlrabi slaw in any form is really good, but I like it a lot cooked, preferably in butter. There’s a fairly labor-intensive recipe in the Ad Hoc book that’s pretty fabulous. Here: http://www.ochef.com/recipes/r566.htm – It’s totally worth the effort if you ever find yourself with time to spare. That isn’t too bad! It looks amazing! I am limiting my butter intake currently, but maybe for Thanksgiving or something fancy where I have an excuse, haha. Yeah… I’d say it’d be the same with olive oil or similar, but I’d be lying. On the Ad Hoc book scale of difficulty it’s super easy, but on the normal person scale of difficulty it does take a while. Sooo good though. I haven’t tried it yet, but I suspect they’re probably really good lightly steamed (so they still have a little crunch) with something that wont take away from their sweetness – like maybe a lemon & basil sauce or some sage. I’m pretty jealous of your kohlrabi – we haven’t had it since the early spring.